Bryce Harper drew big cheers, a pair of walks and an unusual defense Saturday in his spring training debut for the Philadelphia Phillies. “Hit a lot of homers, drive the ball like you’re capable of, do exactly what you always do, be Bryce Harper,” said Kapler, who is known for using many shifts. Wearing No. 3 on his uniform, eye black under his eyes and a white armband with “HEART” written in red letters around it, Harper dug into the batter’s box as “In West Philadelphia born and raised …” blared from the stadium’s speakers. 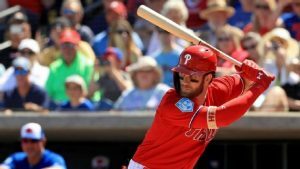 Batting third as the designated hitter, Harper didn’t go deep but jogged around the bases after Rhys Hoskins blasted a two-run homer off Jays right-hander Matt Shoemaker on the first pitch after the first walk in the first. Harper took a mighty swing and missed on the first pitch he saw, and fouled off the first pitch he faced in the third. He looked at eight balls outside the strike zone, including a few close ones. Although he is known for hitting home runs, Harper also is a patient hitter who knows how to work the count. He has a .388 career on-base percentage and had a career-best 130 walks last season.